The whipped cream or meringue debate. 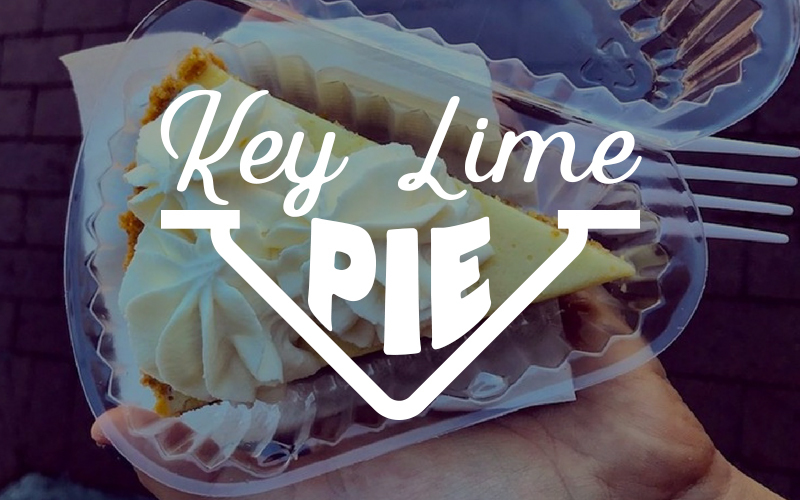 Make no mistake about it: Key lime pie simply tastes better in the Florida Keys than anywhere else. Must be the sunshine. Key limes are yellow, not green, and they’re essential to making an authentic key lime pie. That’s the one aspect of the pie that everyone agrees on. Beyond these two juicy facts, the local key lime pie debate looms large. The strongest opinions aren’t about the fruit, crust, recipe, or even where to find the best pie. Rather, strongly held personal preferences are all about the topping. “We’re pretty laid back in the Florida Keys and don’t get contentious over very many things—except, that is, whether key lime pie should be topped with whipped cream or meringue,” says Carol Shaughnessy, longtime resident and Florida Keys publicist. 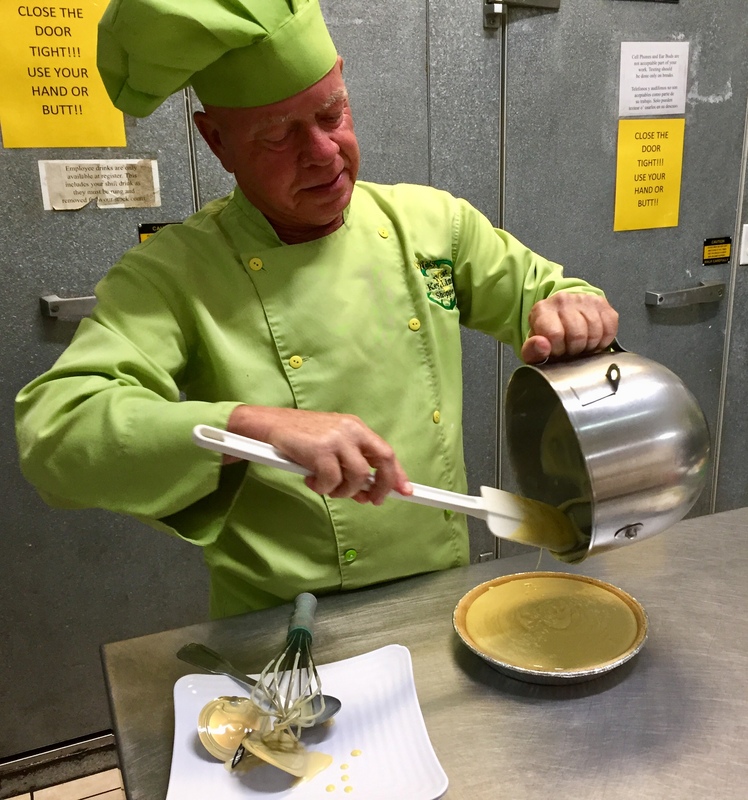 I caught up with pie guru Kermit (honestly, that’s his real name) Carpenter in his kitchen behind Kermit’s Key West Key Lime Shoppe to delve into Florida’s state pie in more detail. You can’t miss this yellow- and green-painted building, especially when Kermit is posing on the doorstep at this prominent corner facing Old Town’s waterfront. In his signature lime green toque and chef’s jacket, Kermit is ready for a cooking demonstration and the revelation that, “the secret is my grandmother’s recipe.” For more than 25 years, Mr. Key Lime Pie has been churning out what now amounts to 300 pies per day just to meet the shop’s walk-in demand. The process is straightforward and not secret in any way: Blend sweetened condensed milk and egg yolks*, add (genuine) key lime juice, pour into a graham cracker crust, bake for a bit and eat. As for the topping. Kermit is a whipped cream kind of guy. 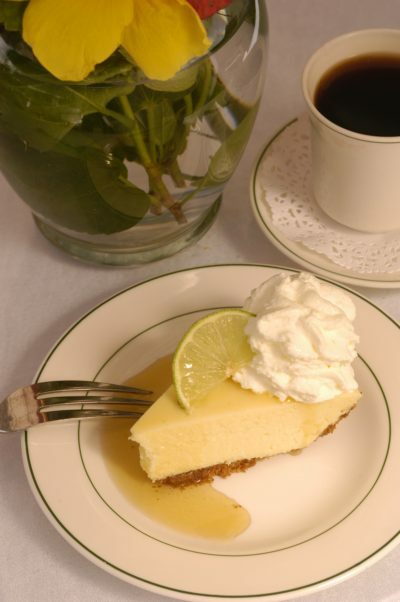 From family diners to fine dining restaurants, at least one variation of key lime pie appears on menus up and down the Florida Keys. “Almost every chef or restaurant puts an individual touch on the pie, so you’ll get slightly different versions at different places, which is part of the fun of key lime pie,” says Shaughnessy. Try Chef Michael’s version in Islamorada if you like just the right amount of tangy tartness. Place an order at cozy Mrs. Mac’s Kitchen II in Key Largo if you think key lime freeze sounds like fun. In Key West, head for brunch at Blue Heaven for the lightest, fluffiest meringue topping under the skies. 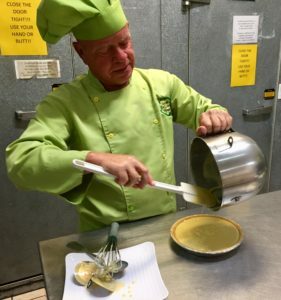 Until your next trip to the Florida Keys, make an authentic key lime pie at home with this recipe courtesy of The Florida Keys & Key West tourism experts. Blend milk and egg yolks at slow speed until smooth. Add key lime juice and blend. Pour into pie crust, spreading evenly. Bake in preheated oven at 350º F for 15-20 mins. Cool pie 20 minutes before refrigerating for 2-3 hours. Serve the chilled pie with whipped cream or meringue topping…or no topping at all.